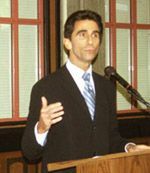 State legislation sponsored by Assembly Member Mark Leno which would require that landlords own a property for at least 5 years before invoking the Ellis Act to “go out of the business” would have stopped 78% of the Ellis evictions in 2003 and 2004. This is based on looking at each Ellis eviction in those two years and determining how long the landlord had owned the building based on property transfer records. Originally adopted to let long-term landlords “go out of business,” the state Ellis Act is now primarily utilized by short-term real estate speculators who are buying buildings and immediately invoking the Ellis Act-going out of business within hours or days of getting into the business. A study of all Ellis Act evictions in 2003 and 2004 by the San Francisco Tenants Union found that well over half of the Ellis filings come within 6 months of the building’s purchase; almost 2/3 come within the first year. In the last two years, for example, a Mill Valley real estate company-Chetcuti & Associates-has done 8 Ellis evictions, including 4 just recently filed on one small alley in the Mission (Woodward Street). Shortly after buying each of these properties, Chetcuti & Associates invoked the Ellis Act-a state law which says landlords can evict tenants if they want to go out of the business of being a landlord. The Ellis Act, originally passed to give longtime landlords an “escape valve” to get out of the rental business, is now primarily used by real estate speculators to evict tenants in buildings which have just been purchased. Chetcuti & Associates evicted tenants in one building one day after they bought it. They evicted tenants in 3 other buildings just a month after buying it. In 3 other buildings, tenants were evicted 3 months after Chetcuti bought the property. In only one did Chetcuti own the building longer than 6 months, and that one was owned for just a year. North Beach Partners, which has done 6 Ellis evictions in North Beach, operates similarly. Of the 6 buildings it evicted all the tenants from (so they could get out of the land lording business), 5 were owned for 6 months or less. Only one was owned for a year or more. In three of the properties, all the tenants were evicted within 3 months of North Beach Partners purchasing their buildings. These examples are not unique. Analysis of all the Ellis evictions filed in 2003 and 2004 found that most Ellis evictions (52%) are filed within 6 months of the landlord buying the property. Almost 2/3 (61%) are done within the first year. The state Ellis Act (California Government Code 7060-7060.7) was adopted by the California Legislature in 1985 after the California Supreme Court ruled that landlords do not have the right to evict tenants to go out of the business of being a landlord. The court reasoned that a landlord who wanted to go out of business had the same recourse that any other business owner did: sell the business. Selling the property would accomplish the goal of going out of business, without evicting tenants. In response, the Ellis Act was adopted. In adopting the Ellis Act, the legislature said: “It is the intent of the Legislature in enacting this chapter to supersede any holding or portion of any holding in Nash v. City of Santa Monica, 37 Cal.3d 97 to the extent that the holding, or portion of the holding, conflicts with this chapter, so as to permit landlords to go out of business.” (Section 7060.7), clearly stipulating that the basic intent of Ellis was to let landlords evict tenants for the purpose of going out of business. The legislature further strengthened that intention by including provisions in the Ellis Act which severely restrict the landlord’s ability to evict and then re-enter the land lording business. For the next 15 years, the Ellis Act was utilized in San Francisco exactly as it was intended: each year there were 1 or 2 Ellis Act evictions, all of them done by long-term landlords who were retiring or otherwise wanted to stop renting out property. In 1998, though, San Francisco voters adopted Proposition G, which restricted so-called “owner move in” evictions, most notably by banning OMI evictions of senior, disabled and catastrophically ill tenants. Proposition G also limited OMI evictions to one per building. At that time-the beginning of the dot-com boom-OMI evictions were soaring as they were being used to evict tenants and convert apartments into “Tenancies In Common,” a form of condominium which was exploding because these TIC conversions were exempt from the city’s condo conversion law. Unable to utilize OMI evictions for these TIC condominiums anymore, real estate investors realized that the Ellis Act could also be used to evict tenants and convert to condominiums. By the letter of the law, they were correct: after the tenants were evicted, the units would be sold as condominiums so, in fact, the units would not be rented again. However, by buying buildings and quickly “going out of business” was hardly consistent with the spirit of the law. Nonetheless, Ellis evictions soared-from 0 in 1997, to 12 in 1998 and to 205 in 1999. Last year there were 235 evictions in 105 buildings. Quickly it was seen that the Ellis Act was being abused by real estate speculators. The John Hickey Brokerage Company, which had utilized OMI evictions for TIC condo conversions (and was most know for the 1998 eviction of 86 year old Lola McKay, who died fighting her eviction) quickly moved over to the Ellis Act, buying a 6 unit building in North beach and evicting all of the tenants (3 of whom were seniors) the very next day. Other familiar speculators behind OMI evictions were soon seen doing Ellis evictions. Tenant groups regularly saw tenants coming in with Ellis evictions done by new owners of their buildings. In fact, when tenants saw their building being out up for sale, the universal expectation was that the tenants would soon be Ellised. Anecdotally, tenant groups know there were few long-term landlords doing Ellis evictions and there were a lot of new landlords doing Ellis evictions. The Tenants Union examination of the 2003-2004 evictions shows this anecdotal evidence to be accurate. The vast majority of Ellis evictions are done soon after a building has been purchase. In fact, the timeline between the purchase of the building and the filing of the Ellis Act evictions is often dramatically quick: 1/3 are done within two months and almost 1/4 (23%) are done in the first month of ownership. 13% are actually done within the first 10 days of ownership! 78% are done within 5 years of ownership, and just 13% were landlords who met the envisioned use of the Ellis Act: long term landlords (10 years or more of ownership), getting out of the rental business. San Francisco Assembly Member Mark Leno has introduced legislation in Sacramento which would end the abuse of the Ellis Act by real estate speculators. His legislation would require a 5 year ” holding period” prior to a landlord invoking the Ellis Act. Before tenants would be evicted under the Ellis Act, his legislation would require that the landlord have owned the building for at least 5 years. Such a requirement brings the Ellis Act back to its original intent and will shut the door on the real estate speculators. Assembly Member Leno and tenant groups will hold a press conference on Leno’s legislation on Friday, February 18, 1 PM, at 424 Francisco Street (at Powell). 424 Francisco is one of many Ellis evictions in North beach being done by North Beach Partners. North Beach Partners filed the Ellis Act on 424 Francisco 189 days after buying the building.